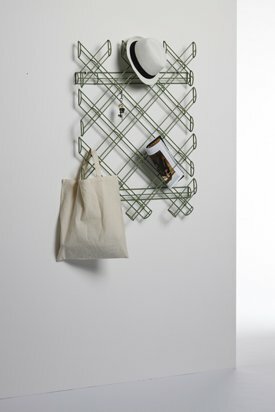 Whoever interprets Philipp Drexler's Jägerzaun coatrack as a nostalgic reminiscence of the infamous fence around German single-family properties, is way off the mark. Drexler's fence piece of 90 x 60 x 15 cm, unwound into steel wires, may use the classic look of this folksy glorified icon, but other than that, it has little to do with a fence. Truth be told, Philipp Drexler focuses rather on the unconventional use of this three-layered structure out of diagonal and horizontal wooden bars: namely, some people's habit of sticking their no longer useful burdens into the diamond-shaped «compartments» of this fencing. All aesthetic aspects aside, we have to admit that this is quite a practical idea, even if its functionality may need to be further elaborated. 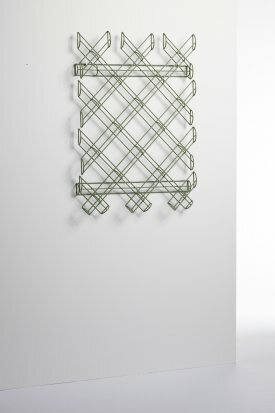 This is exactly where Drexler comes from with his filigree transformation, as his transformation into angles, hooks and lines provides a much greater number of storage possibilities than the «real» trellis fence could ever offer.